!! OMG, unbelievable: Homeless display at Barneys !! During my most recent visit to New York, I stopped by Barneys New York for a little shopping, and upon stepping out of the elevator at the Coop floor, this is what faced me: Mannequins with sad clown faces dressed up as homeless people (albeit in expensive duds). The scene is so accurate down to the last detail that I did a triple take before uncontrollably saying something out loud about how f*cked up it is. We offend people every day here at !! omg blog !! but I think Barneys has us beat with this store display. Which part of “Taste. Luxury. Humor.” is this? « PREVIOUS ENTRY: OMG, new Janet Jackson song: “Make Me”! 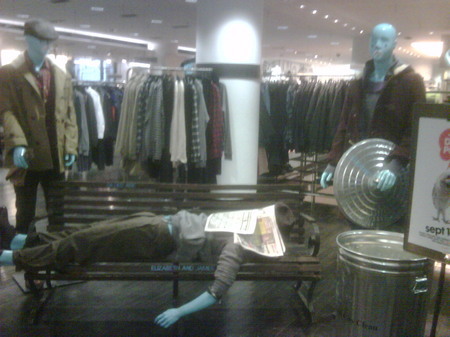 2 Comments on "OMG, unbelievable: Homeless display at Barneys"
HAHAHA “Derelicte” ala Zoolander anyone? Anyone?? ?